Is MADRONE wood safe for the skin and lungs? Just bought 13.3 acres in Applegate Valley in Southern Oregon. Tons of Madrone trees on it, ranging from big honkin' matures to teenagers and little sprouts. There are some with dead branches, and some down wood that I want to clear out in interest of fire safety. I'm interested in making log / rustic furniture, but want to know if there are issues with toxicity, skin irritation, etc., if left unfinished. Also, if the smaller branches are left in original form, does that silky red surface survive? Comments for Is MADRONE wood safe for the skin and lungs? Madrone wood is safe as can be at least for me! 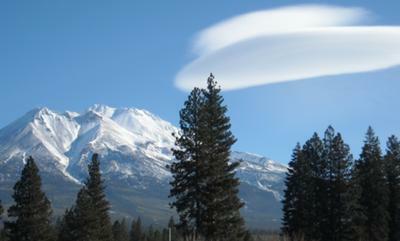 Looks like a flying saucer over Mt Shasta! Wow! To answer your question, I have worked with Madrone for ten years and have never had the slightest of problem with toxicity. In fact, green Madrona smells delicious when you cut it inside the shop. Just make sure to wear a mask when you do any sanding because of the dust. It also is harmless to your skin unless you react to wood in general, then who knows. Arbutus / Madrone is a wonderful wood to work with. Take your pieces to dry out of the weather and sun and it should dry fine if not too thick. The reddish color should stay as it dries but may darken a bit. You can add walnut oil or tung oil after for a nice finish. Use 600+ grit sandpaper where needed.